Call me Spademan. From the moment I heard about this extreme grilling technique from the Australian outback, I was hooked. It requires only two things: a clean steel shovel and a hot fire, and it’s about to boost your reputation as an out-of-the-box grill master. Beach barbecues, camping trips, and even backyard cookouts are about to get a lot more interesting. Shovel grilling began, so legend goes, with a rancher in the outback who had lamb (no shortage of that in Australia) and a campfire, but no grill grate to position over it. So he sterilized the blade of shovel in the hot flames, arranged lamb chops seasoned with salt and pepper on it (and why not chopped fresh garlic and rosemary, too? ), and grilled the lamb on the spade thrust directly into the fire. The process endowed the lamb with the heady smoke flavor you get from grilling over a wood fire (the smoke curls over the lip of the shovel) with the sizzling crust you get when you sear meat on a hot griddle or plancha. Plus the process looks cool as all get out, and you should never underestimate the importance of cool factor. Shovel grilling is super easy and you can do it over a campfire, wood-burning grill, or charcoal grill. I suppose you could do it on a gas grill, but I’m not quite sure I’d see the point. Use a well-made shovel with a flat blade (steel, not aluminum) and a long wooden handle (not fiberglass or plastic). If new, scrub off any protective coating or manufacturing oils and sterilize the blade in the fire before loading it with meat. If employing a used shovel—rust-free, please—thoroughly scrub the blade with soapy water, then sterilize in the fire. Preheat the blade before arranging the meat on it. How hot should you preheat it? Enough so that when you sprinkle a few drops of water on it, they evaporate in 2 to 3 seconds. This promotes caramelization on the surface of the meat, and helps prevents sticking. Expose only the blade and metal part of the shaft to the heat to avoid burning the handle. Lacking a shovel, you could use a large cast iron skillet or griddle or a Spanish-style plancha. This grilling technique words best with 1-inch-thick chops (lamb, pork, or veal) or steaks (beef, pork, elk, or venison). For that matter, the method is awesome for tuna or salmon steaks as well. Take your selected proteins in an ethnic direction with your seasonings. For a Spanish twist, rub with olive oil and dust with salt and pimentón (smoked paprika). For Tuscan chops, season with olive oil, lemon juice, and fresh chopped rosemary and garlic. Cumin, cilantro, garlic, and chile powder take the meat in a Mexican direction. You get the idea. 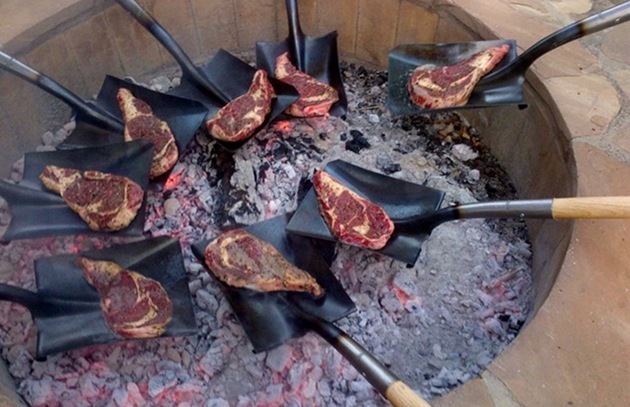 After you’ve plated the meat, return the shovel blade to the fire to burn off any food residue. Brush off any carbonized bits with a sturdy grill brush. Once the blade has cooled completely, oil it with vegetable oil in anticipation of next time. Because you’ll definitely want to grill this way again.